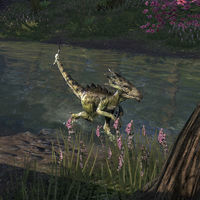 Clannfears are aggressive, quick, and dangerous Daedric creatures. They have a small frill, plated spikes on their spines, and a deadly tri-tipped tail. They are flock inclined—they will work together to bring down enemies—but they are still deadly individually. They have bird-like movements, but retain an almost brutish quality to their attacks. This page was last modified on 2 February 2019, at 19:32.